(1) ^ ^ ^ ^ When the lot at 2313 Alpen Court become available in a bank foreclosure deal in early March, we decided to buy it with the intention of continuing to allow public access to the Snowflake wash trails and pathways in the greenbelt directly behind. (3) ^ ^ ^ ^ A new sign placed near the south-west corner of the new lot. 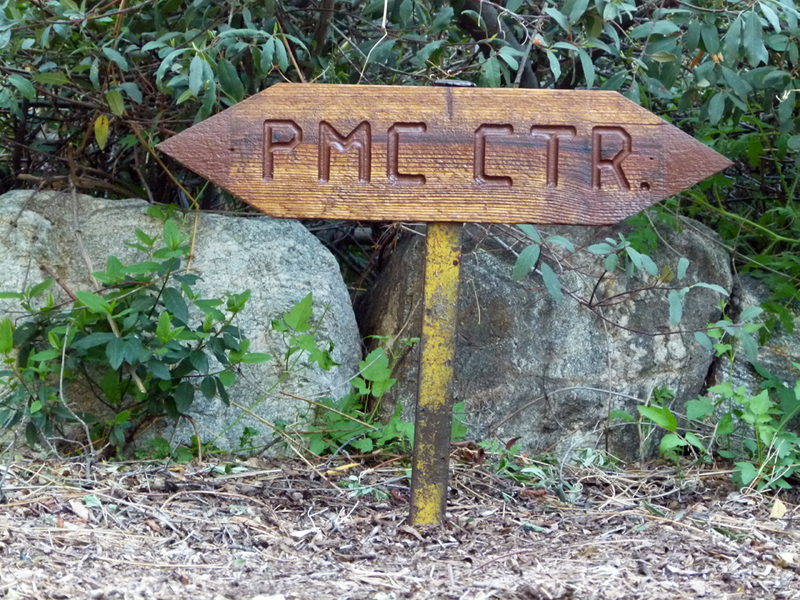 You can take the pathway either to the left or to the right to get to the Pine Mountain Club village center. Both pathways merge together again roughly in the middle of the green belt. One route is not shorter than the other, so this is not about a shortcut. Going left is more sunny, while going to the right is more shady. 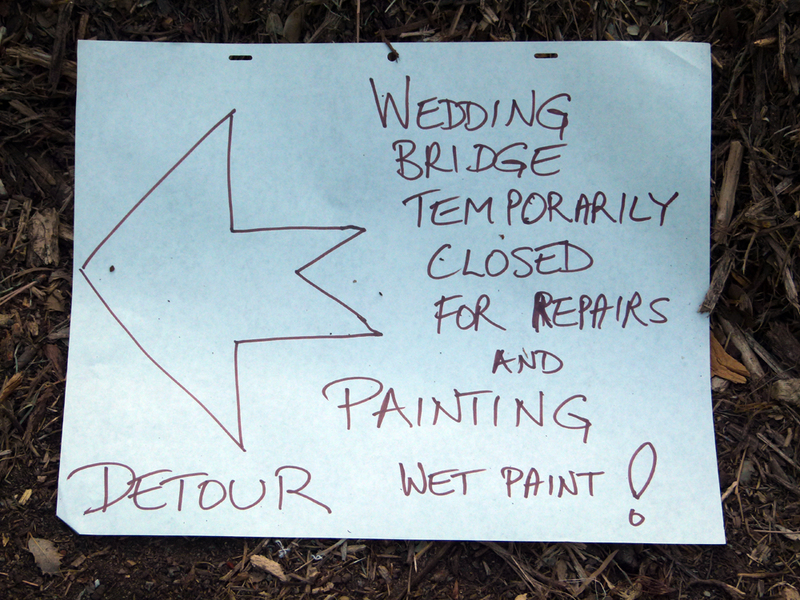 Left goes via Victory Circle and the Zen Garden, while right goes over the Wedding Bridge. (4) ^ ^ ^ ^ Fence being constructed on the new lot. It serves several purposes, one of them being to stop somebody accidentally stepping over a retaining wall just behind the fence (so in part it has a public-safety function). 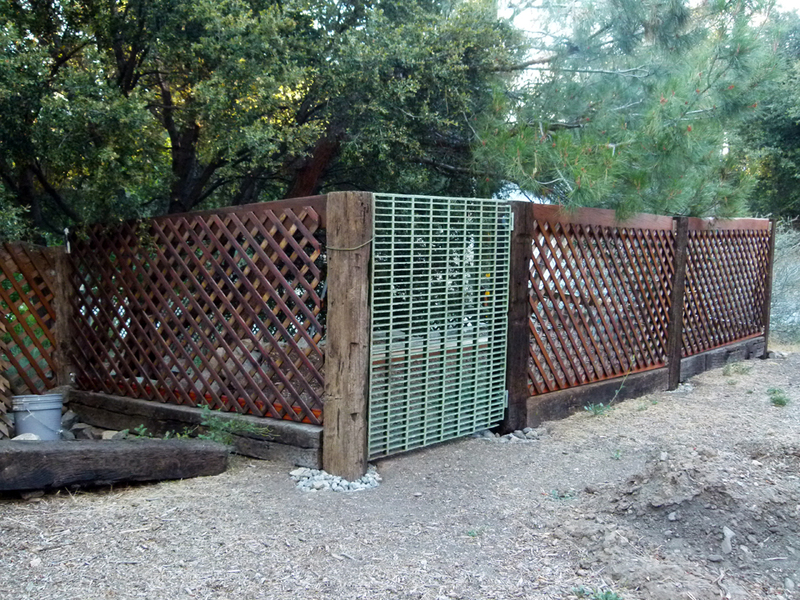 It also keeps our dogs separated from other dog visitors passing by. 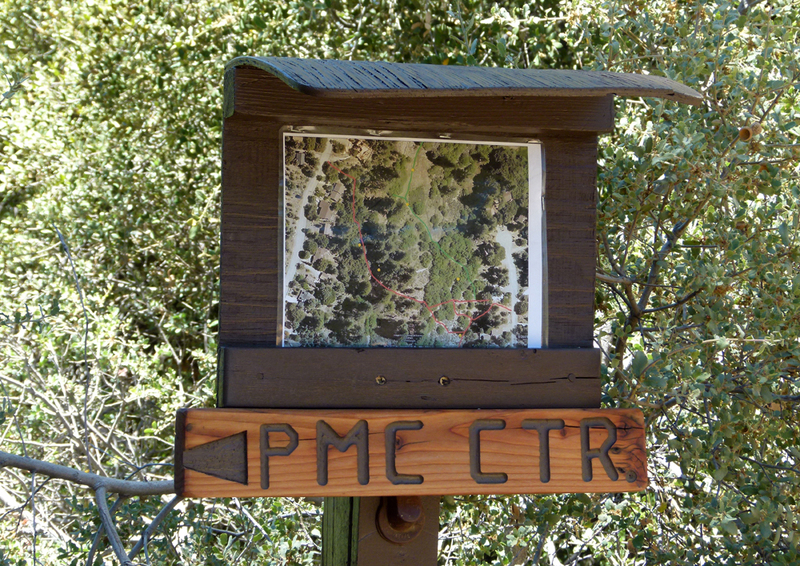 (5) ^ ^ ^ ^ A map of the main trails at the Alpen Court trail head. (Video) ^ ^ ^ ^ Taking our English Shepherds and two of our neighbor's dogs for a daily walk along the Snowflake trails (June 2012). 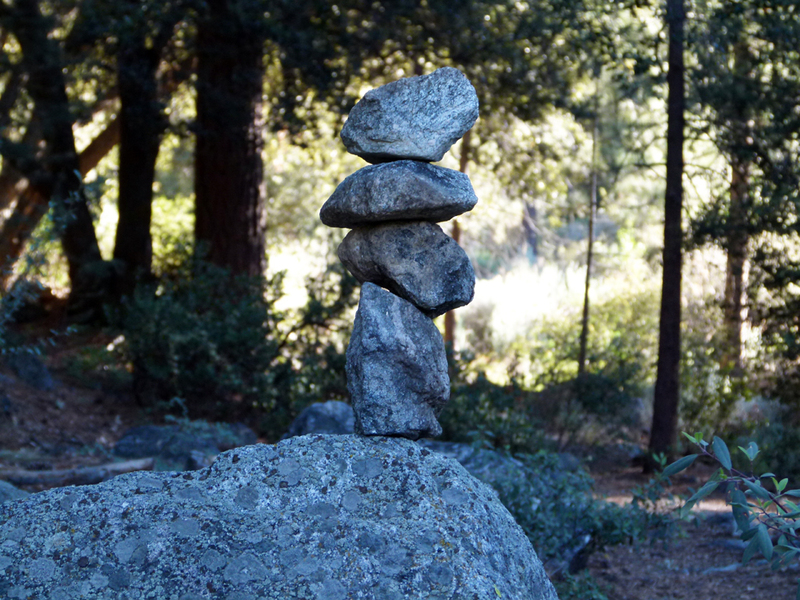 (6) ^ ^ ^ ^ On the trail heading south up the wash. I typically pass this spot every day when I take our dogs for a walk. 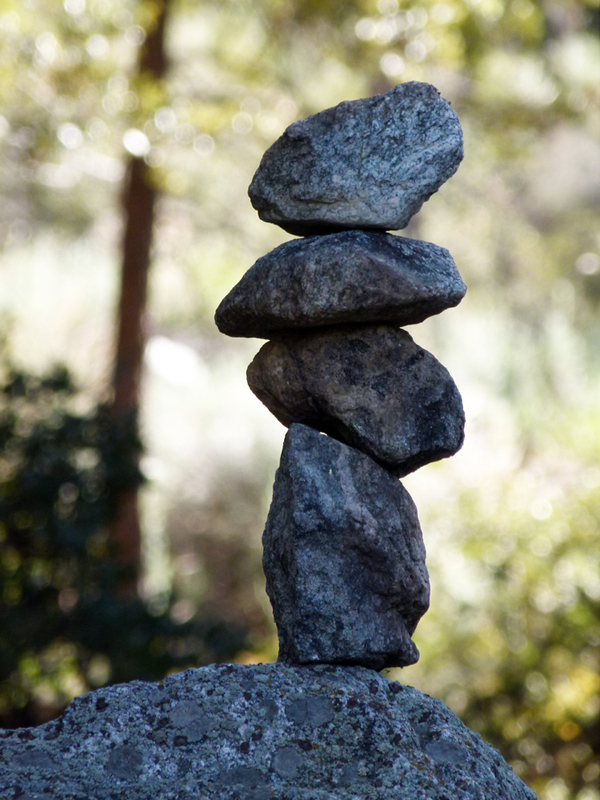 (7) ^ ^ ^ ^ Rock sculptures courtesy of Anders (now living in Norway). 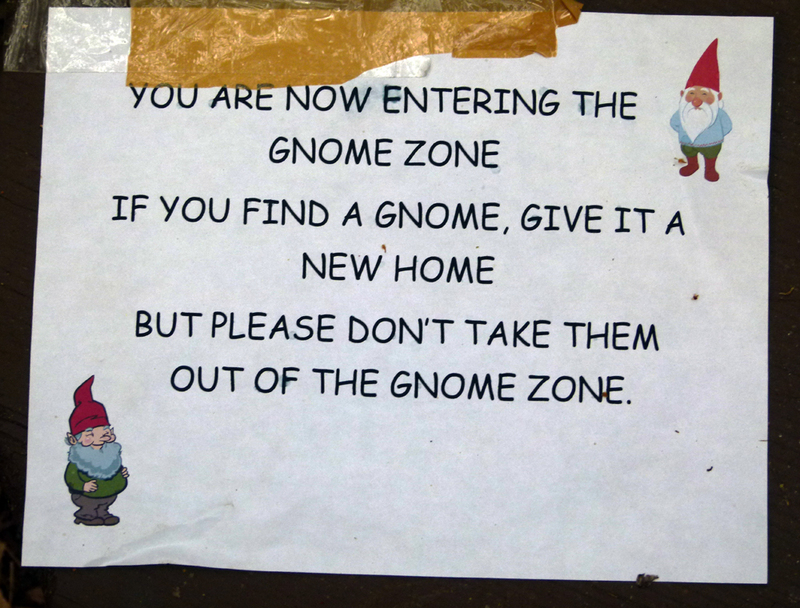 (8) ^ ^ ^ ^ The gnomes were back in July much to the children's delight. Thanks again to the local Bed & Breakfast! (9) ^ ^ ^ ^ Detour during maintenance work on the Wedding Bridge in early October. 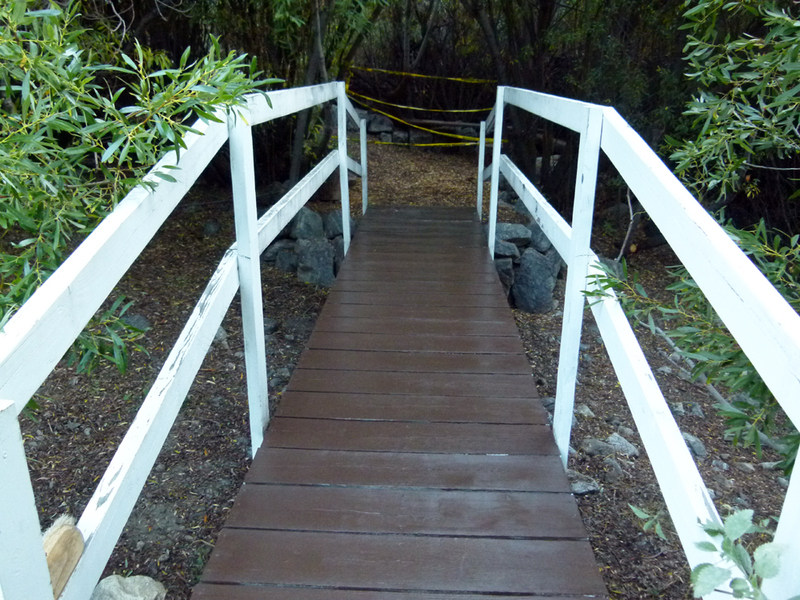 (10) ^ ^ ^ ^ Painting the Wedding Bridge brown to better compliment its natural environment. 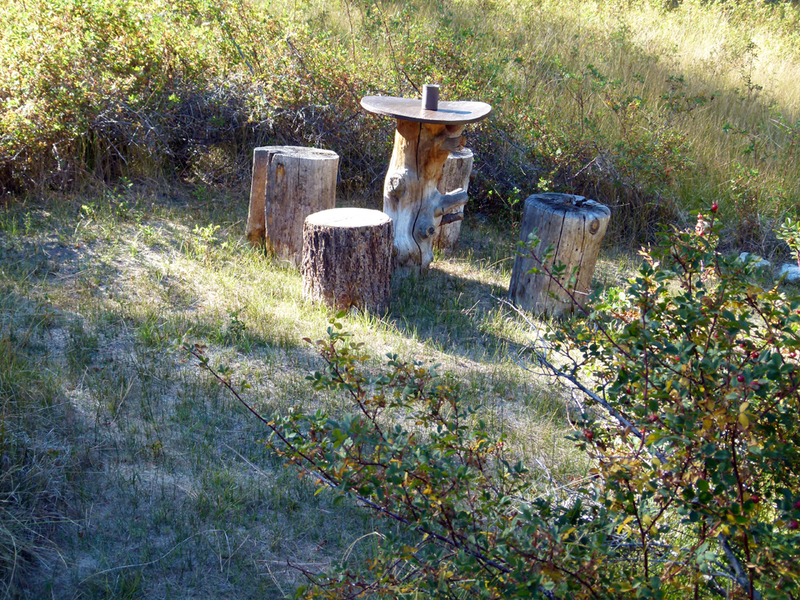 (11) ^ ^ ^ ^ Wild Roses Table bathed in late afternoon sunlight (10-7-2012). 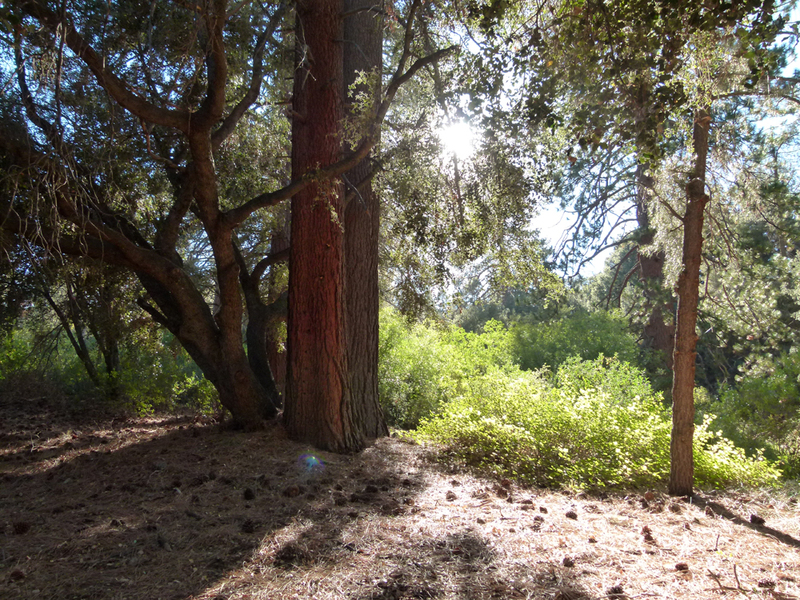 (12) ^ ^ ^ ^ Fall sunlight in the Enchanted Forest (10-7-2012). 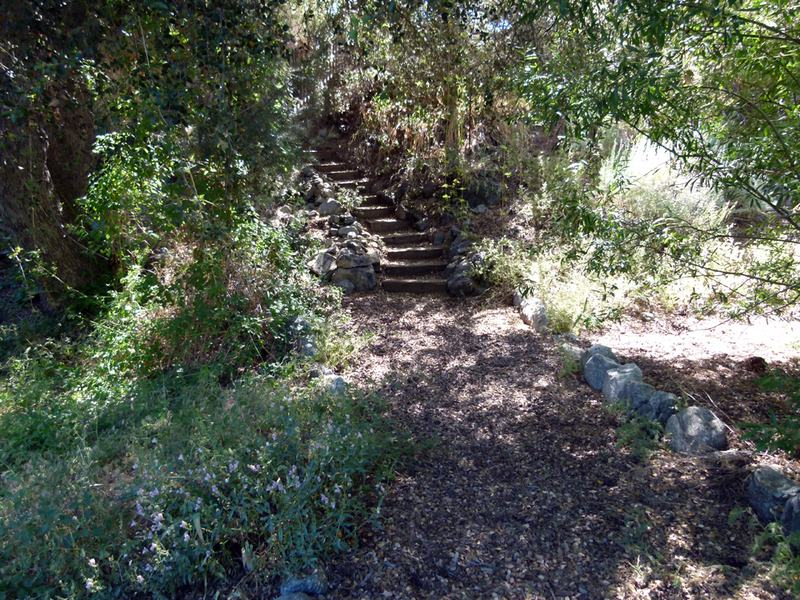 (13) ^ ^ ^ ^ Stairs leading to the Snowflake House (7-1-2012). 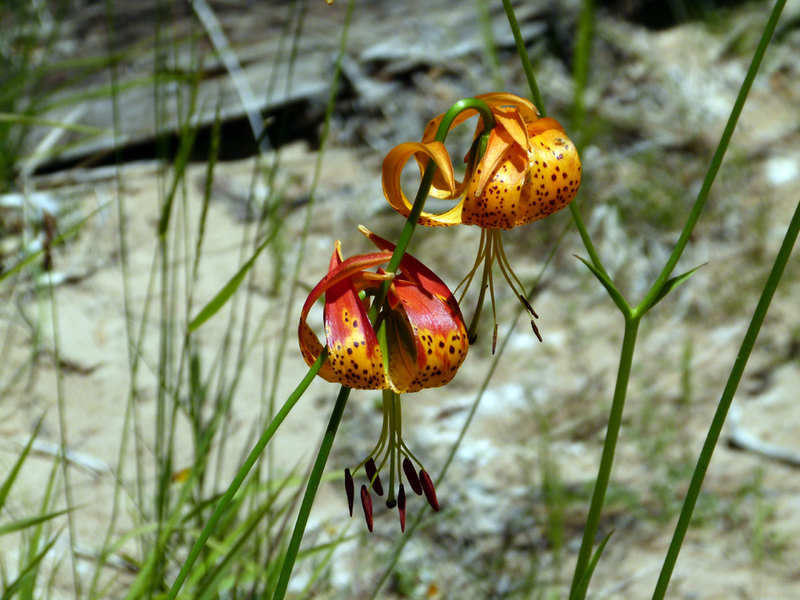 Spectacular wildflowers seen in the Sespe Wilderness during a day hike to the "Fishbowls" in mid-July 2012. 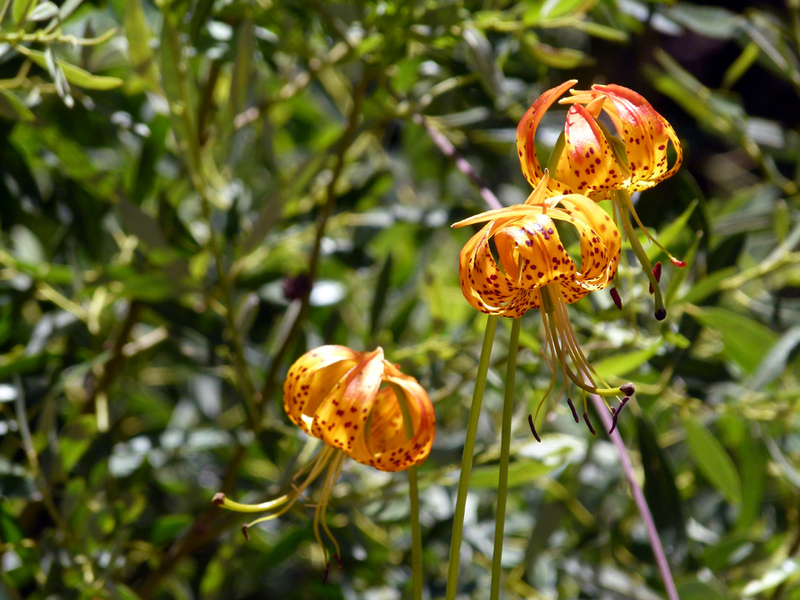 Positive identification is always difficult but this is likely to be Lilium pardalinum subspecies pardalinum, which is also known as Leopard lily. 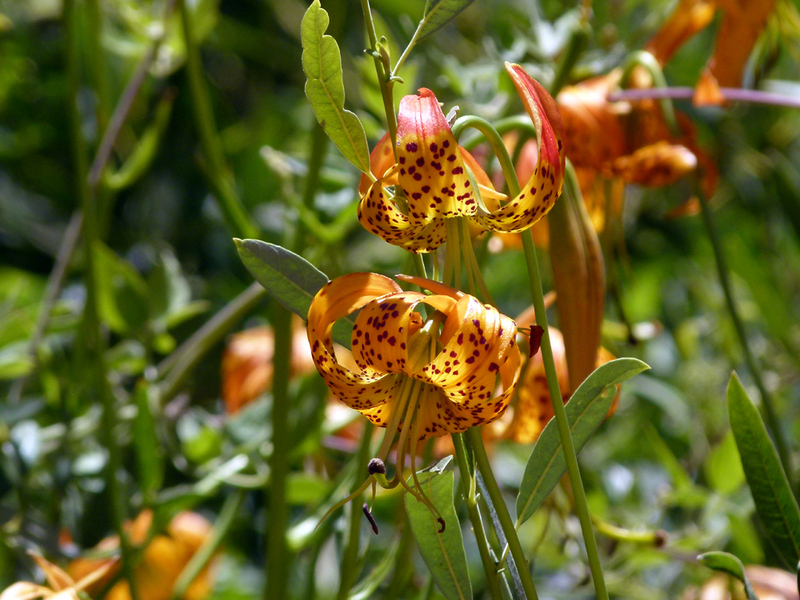 This species has been collected in "Piru Creek, just downstream from the Fishbowls campground" adding to the likelihood this is indeed Leopard lily. It might also be a Humboldt Lily (Lilium humboldtii var. ocellatum) which look very similar and live in drier habitats (and are more endangered). Both are California native species. The spectacular Leopard lily is very tall, often 6 feet and up to 8 feet in height. It is a stout-stemmed perennial with multiple flowers on each stalk. The plant typically flowers in June to July. 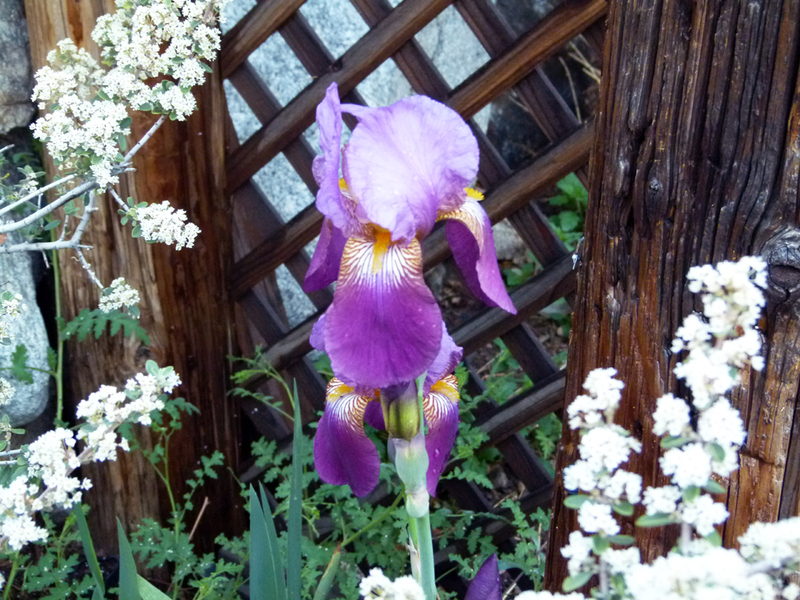 It is summer-deciduous, dying back after flowering in mid-to-late summer.